It all happened as a matter of circumstance. About a year ago, I was at the range with my Encore 15 .308, and there was a fellow at the bench next to me with a .223 Contender. After we talked for a bit, I offered to let him shoot the .308, which he did. I was shooting 168 grain bullets behind a stiff charge of Varget stiff recoil, too. He was impressed with the accuracy and balance of this Encore, but not so impressed with the trigger. In turn, I got to shoot some clay discs (trap-shooter targets) with the Contender .223. He had placed them on the dirt of the backstop at a distance of about 105 yards. My first shot looked at first like a clean miss, but through the spotting scope I saw I had punched a clean .224 hole dead through the center of that disc. I cleanly dispatched a number of these clays without missing a single one. I didnt know it at the time, but I had to have one of these Contenders. The most remarkable things about that gun were the low level of recoil, and the very nice trigger pull. The trigger was light, crisp, and clean as opposed to my heavy, lawyer-proof, Encore trigger (since reworked to a crisp 28 ounces by Fred Smith at Bullberry). I didnt own a Contender frame, but because of rumors (since substantiated by T/C) that Contender production would soon be discontinued, I felt that I needed to get one while they were still available. I was hampered a little by a new Maryland law that requires all handguns to be accompanied by a fired shell casing a little difficult with just a frame. Virgin Valley Custom Gun found a frame that was manufactured before 10/1/00 and thus was exempt from the new law, so I bought it. I had the frame sent to my FFL and was able to retrieve it from him in about 4 weeks from time of purchase (waiting period plus shipping time). My FFL, Rod Ellingsworth, an accomplished gunsmith, reduced the trigger pull to the desired 1.5 lbs. Later, Virgin Valley Custom Guns offered me a deal I couldnt resist on a .17 Remington barrel for my new frame. The barrel is a stainless steel, matte finish, 15-inch bull barrel with a Virgin Valley scope base installed with 6 screws. I am still not sure why I need 6 screws to hold the scope on this barrel, but I dont think that they hurt anything. The 10 twist on the barrel should be fine for bullets up to 30 grains, and I intend to use mainly 25 grain bullets in this barrel. I have printed out a ballistic chart for my gun with the 25 grain Starke bullets to show what it will do at extended ranges. Since I am hoping to be able to take long shots with this gun, I need to know how much it would drop at the longer ranges. 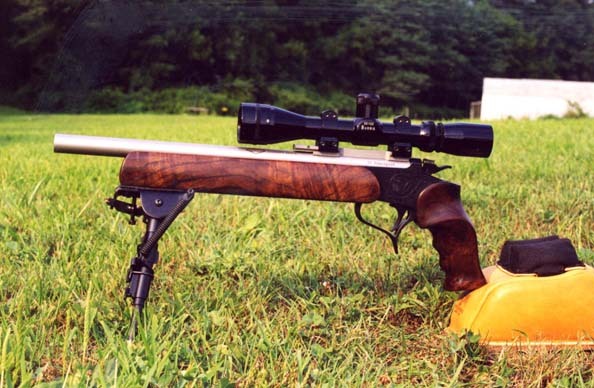 Realistically, I want to be able to shoot ground hogs to 200 250 yards with this gun. I have a small copy of this chart that I can tape to the fore end when going afield. My chart was created using a free software program called PointBlank, available from www.huntingnut.com. It is very useful and easy to operate not to mention free. I ordered a Burris 3-12 EER for the project, but I just couldnt wait for it to arrive, so I started out with a Burris 2-7 EER scavenged from the Encore mentioned earlier. Burris is the handgun scope as far as I am concerned. When you are looking for a highpower handgun scope, this is the only real option that you have, and it is a good one. The 3-12 power scope is great, the eye relief is sufficient, and the field of view is excellent for such a powerful scope. I got the fine plex and the target knobs for some serious long range shooting. The high magnification is almost imperative for shooting accurately at long ranges with a handgun. I got a nice target style fore end 11 long, flat and about 2 wide for use in the bags or use with the short Harris Bipod (Model BR) I installed. The grip and the fore end are both from Bullberry/Woodsmith. They were inletted to fit perfectly and are fantastic looking (See picture 1). All of those Warmth of Wood articles by Gary Ramberg must have gone to my head because I came up with the bright idea that it would be nice to finish the stock set myself. I ordered both the fore end and the grip in a semi-finished condition. I thought it would be fun to finish them myself, but after about 3 weeks of sanding and finishing decided that it might be more fun to have them done. I applied 6 coats of Tru-oil finish to the stock with my finger, using 0000 steel wool between coats. It looked good, but I was having trouble getting all of the grain to fill. At this point, I was frustrated and turned for help yeah I know its like stopping at a gas station to ask directions. I turned to my favorite internet message board, GoGoVarmintGo, explained my dilemma and got several responders. I learned from Claude Gatewood of Gatewood stocks that I could use wet/dry sandpaper to apply the oil with a sanding motion to fill the voids. I did this and it worked perfectly. I tried Arm-R-Seal in place of Tru-oil on the fore end and am very happy with the results. The grain was filled, and I achieved the rubbed oil finish that I wanted. I think I will enjoy the wood more knowing I finished it myself, and I hope to finish a one-piece stock in the future. I experienced some difficulties with my scope mount system. The VVCG base seems to be undersized compared to the Weaver base. This requires the Burris zee rings to be tightened excessively, and they loosened on two occasions under the mild recoil of the .17. As per the recommendation of Virgin Valley Custom Gun, I tried the Warne rings and have experienced no additional problems to date. I actually like the Warne rings more than the Burris, due to their ease of installation and removal. I wish I could tell you that I spent hundreds of hours trying 4 different powders and 5 different bullets, but that just isnt the case. I had every intention of trying a few different powders and a couple of different bullets, but with the results that I had with the first combination, I decided that the time would be better spent looking for groundhogs or working up loads for other guns. The added bonus of the load that I settled on was that it was the same load that my Remington model 700 prefers: 24.2 grains of IMR4320 behind a 25 grain Starke RPVB. The average velocity of the preferred load was 3640 fps (pretty impressive out of a stubby barrel handgun). 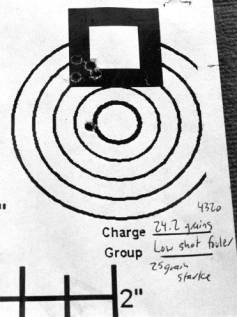 I found that the gun would shoot less than an inch routinely and could shoot close to 5 shot groups at 100 yards. (See pictures 2&3). The range that I usually shoot at only allows shooting out to 100 yards, but I intend to set up a little range at my brothers farm for some 200 yard shooting to see how it will do at the extended range. 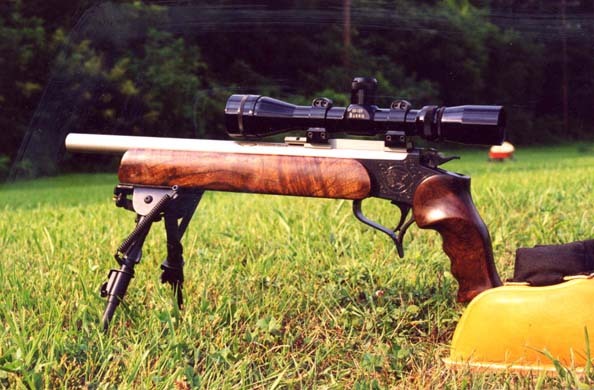 I want to be able to reach out to 200 yards when hunting and to feel confident in this little gun. 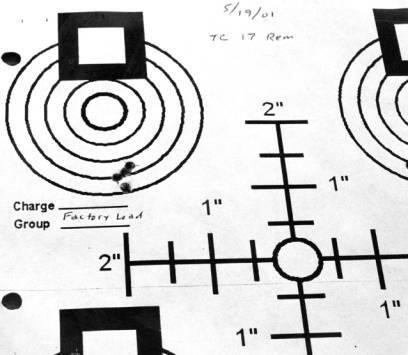 According to the Pointblank software program (www.huntingnut.com), if I am sighted for 100 yards, the drop at 200 yards is 2 inches and at 300 yards is 9 inches. Seen below is some information generated from Pointblank software program for the hand loads. When time will allow, I still plan on trying some Vihtavouri n135 that I had gotten for this gun a while ago, just to see if I can get the velocity up a little more. During one of the days of range testing, I had decided to shoot some Remington factory-loaded rounds that I had in my safe collecting dust. I figured that I would test them for accuracy and velocity with this gun to see how it compared to my reloads. I got quite a surprise from both the chronograph reading and the accuracy results on paper. I figured that they would be fast stepping loads, but the average velocity reading over the 10 shots was only 3250 fps as compared to 3640 fps with the reloads (See Pictures 4 & 5). I was very surprised at the slower velocity of the factory ammunition. I would have been expecting 100 fps lower velocity at the most. Now for the pleasant surprise: both 5 shot groups measured less than an inch much less than an inch! One measured 0.89 and the other measured 0.36 out of a handgun no less! 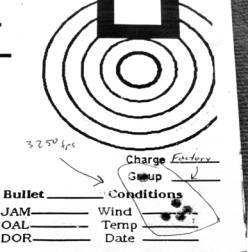 The POI was approximately 2 inches lower than the reloads I had the gun sighted in for, but they still printed on the paper. If I needed to use factory ammo in this gun, the POI would be 3 inches low at 200 yards and 12.5 inches low at 300 yards (assuming that I adjusted the scope so that the POI at 100 yards was on target). Seen below is a chart generated from Pointblank software program for the factory loads. While looking at the groups shot, I noticed a large number of shots were outside of the group. I was first attributing these flyers to a bad load or even from being the first shot from a clean barrel. What I found was that the first shot was a little lower in velocity, but usually only by 30 50 fps, which wouldnt account for the vertical dispersion that I was experiencing. After determining that the velocity wasnt the cause of the vertical dispersion, I was unsure what might be causing the problem. I think that the vertical dispersion is occurring from my gun handling technique while shooting the handgun from a bench. I have been using the bi-pod and then resting the grip of the gun on the edge of a rear sand bag. I would press the grip into the bag to ensure a solid hold on the target (See picture 6 below). This technique was very effective at keeping the gun still during the trigger squeeze but was not allowing the gun to recoil consistently. 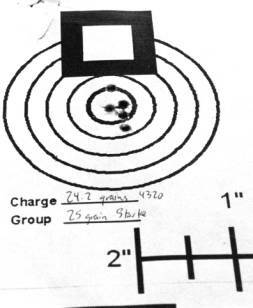 I will need to do some further testing with a different method of holding the gun to prove this theory, but I think that the gun handling is to blame for the vertical dispersion in the groups shown. Every group fired has more vertical dispersion than horizontal which is odd for any gun much less a .17. I would like to shoot this gun using a flat rear bag that can allow the gun to recoil consistently. I may also try using a front rest in place of the bi-pod to see if that reduces the vertical dispersion. If all else fails, I may resort to shooting 3 shot groups (Sarcasm noted). I hope to use this handgun for ground hog shooting out to 200 yards. For any shots further than that, I will switch to one of my longer-barreled .17s until Ive had more long-range practice with the handgun. This project would be a great choice for somebody just starting to get into reloading or somebody with an interest in varmint hunting with a handgun. It is also nice to be able to shoot factory ammo in a pinch. It is easy to shoot, the recoil is low and the enjoyment is significant.